The front porch has gone the way of the outhouse in most suburbs these days, with family activity relegated to the back yard deck. We hide ourselves in an enclosed yard, often in a subdivision with no sidewalks. We end up closing ourselves off from our neighbors and the community. But there are some towns in Michigan that still have front porch communities. Recently I spent the weekend in Frankfort on Lake Michigan in a small, nearly 100 year old cottage with a modest, but adequate front porch. It brought back delightful memories. 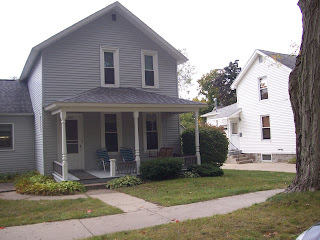 I spent about 20 years living in another old lumber town, Bay City, in a house with a covered porch. While hanging out on the porch in Frankfort, I met about a dozen people who were walking on the sidewalk. Unlike the suburbs, front porch towns don’t have large lawns separating the house from the sidewalk, so it’s pretty natural to engage with folks. For many of us, we dream of having a house “Up North,” and that vision is often a remote cottage on a lake or a river. My Frankfort trip made me reconsider that dream, and I now would like a simple cottage in a small Great Lakes town. As for a view of the lake, we had one less than a five minute walk from the beach on Lake Michigan. We could also walk to downtown restaurants, taverns and stores. It was a real feeling of freedom, not to be tied to a vehicle.